We are always recovering from something—a long weekend, too little sleep, too much fun, too much eating, a bad week at work, a disappointing relationship, an error on our part, an error on someone else’s part, unmet expectations, and so on. Much of our belief in recovery is a desire to return to a state of so-called normalcy. A hope that we can and will return to who we once were and to remind ourselves that the experience that changed us will define us no longer. Life is interruptible. While others get caught in the rut of boredom and sameness, we can’t help but be reminded that life is constantly interrupted and interruptible. Always changing. Unpredictable. Others expect to awaken the next morning to life as it was yesterday. We go to sleep at night with no guarantees that tomorrow will be anything like today. Others talk with confidence about their future—assuredly projecting themselves days, weeks, months, and years into the future. Caregivers typically don’t. We are humbled by the present, and realize that what we think will happen is no guarantee of what will unfold. We know our only guarantee is the present. Control is a myth. Other people believe that their actions alone can effect change. On the other hand, our loved one’s bodies remind us that control is something that is fleeting. We quickly realize that life isn’t ordered the way we thought. Our thoughts and beliefs become chastened by our loved one’s changing physical circumstances, and the world around us seems to push us forward and around, like the experience of being thrown from a raft. Alone, and beyond the raft, the river quickly teaches us that our efforts to protest are futile—there are forces greater than our desires and efforts. Life is fragile. Our bodies are fragile. Our experiences remind us that we live in a world that is beyond our control, especially when it comes to those we love most. Intolerance for triviality. Healthy bodies love consuming the latest celebrity gossip and news. Their fates seemingly rise and fall with their favorite sports’ teams. Over time, caregivers’ tolerance for triviality dissipates. Spending time with people who suffer, or who are struggling, means we can’t help but find it difficult to digest the fixations of popular culture. Meaningless endeavors become a threat to our emerging values. Chatter about insignificant topics or faraway scandals become exhausting and overwhelming when we want someone to notice our own lives. Our challenges are not abstract—they are struggles of life and death. Unlike others, we don’t allow everything and everyone into our lives. We become discerning gatekeepers—only allowing people and information that mean something to us and our loved ones. It’s all personal for us. And we think that’s a good thing. Hellos matter as much as goodbyes. Almost everyone believes in goodbyes. Caregivers, however, pay special attention to hellos. 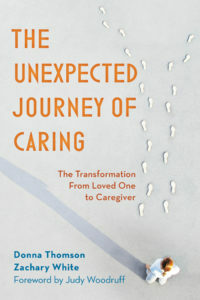 Caregivers realize that the hello is just as remarkable as the goodbye. Someone came to see me? Someone interrupted their routine to visit? Someone prioritized me and chose to make it possible for us to spend time together? Time that could have been spent doing something else? Caregivers hold extra tight to visitors in the midst of the hello greeting because we more fully appreciate the miracle of shared space than those who take for granted the presence of others. For caregivers, the hello is the most precious and sacred of acts. During—not before of after. Before and after photographs are so enticing because two different images of the same person juxtaposed next to one another seemingly reveal everything we need to know about how someone has changed. The contrasting images–changes in weight (loss), hair cut, makeup, clothing–are irrefutable visual evidence that a transformation has happened. For caregivers, change isn’t about how we look. It’s relational. Value based. Internal. Our new selves do not emerge with any grand proclamations because we’ve been changed by what happens when we were with someone. Who we’ve become isn’t a result of anything that happened before or after but a result of what transpired when we allowed ourselves to be close enough to be changed by the person we cared for. Instead of looking in the mirror to notice how we’ve changed, we should look to those with whom we now surround ourselves with. Look to the causes and organizations we identify with. Look to what we value and what we exclude from our life. Notice that we aren’t moved by what others are invested in—we’ve been marked by the experience of care that has no expiration date. We don’t recover from being a caregiver. Care changes us. We take our experiences and our care with us and, in the process, we are remaking the world around us.